The new condition Mi Sphere Camera Kit 360 is currently on sale for $270 with free shipping, with up to three cameras per customer, at Amazon by Amazon itself. MI is one of the brands under the Xiaomi umbrella. This is the US version of the product with a USA warranty. Speaking of “Other Cameras”, the new condition Yuneec Breeze Flying Camera is currently on sale for $229 with free shipping, sold and shipped by Amazon itself, with up to three per customer. This camera is not eligible for the 20% Prime Credit Card Statement credit promotion but it looks like a 3rd-party seller has “tricked” Amazon’s own price bots to price-match them, dropping the blue color scheme of the Ricoh Theta M15 360 Degree Spherical Panorama Camera to the very specific price of $98.24 with up to three units per customer at this price. The other three colors range from $100 to $110 but they are sold by 3rd party seller “Kanga Supply” with the orders fulfilled by Amazon. Kanga also offers the blue for $98, which is what likely triggered Amazon’s own price to drop for that particular color. For more details on this offer, check our introductory post. The Ricoh Theta V currently goes for $430 with a $50 Adorama gift certificate and a Ricoh selfie stick. The trade-in coupon drops the price you pay from $430 to $330. The new condition Ricoh Theta S is on a Black-Cyber Friday-Monday sale for $237 with a free Ricoh case and $9 promotional rewards at Adorama… But if you prefer a lower price and you are comfortable with used, prices start at $156 in “Used – Good” condition thanks to the 20% off in-cart discount, sold and shipped by Amazon Warehouse itself (3rd-party sellers are NOT eligible for the 20% off in-cart discount). These are compatible with the Moto Z series of smartphones. This is an accessory, you don’t have to sign up for a Verizon Wireless plan to buy them 🙂 Check websites, forums, manuals, XDAs, etc for compatibility if you are not certain. WE have another in-stock alert! This time it is the Ricoh Theta V 360-degree camera in-stock and shipping for its starting price of $430 at Amazon by Amazon itself (limit 3 per customer) and at Adorama (orders will ship after 10/15/17). Also shipping is the Ricoh TA-1 3D Microphone for $270 at Amazon by Amazon itself and at Adorama (orders will ship after 10/15/17). Someone at Ricoh must be nostalgic of the GXR system, so they have built a mini system for their Theta cameras? Another one of the IFA 2017 products has made its way to the Pre-ordering party, it is ACER with its new Holo 360 all-in-one 360 degrees camera, available for pre-ordering for $429 at B&H Photo. Per the Taiwanese Chamber of Commerce Fairness Doctrine, any mention of Acer must be accompanied by a mention of ASUS, which brings us to the new ASUS ZenFone 4 Max Smartphone available for pre-order for $199 at B&H Photo. This has dual 13mp cameras, and of interest if you value BIG batteries – this has a 5000 mAh battery! The processor is on the light side being a Snapdragon 430, but has 4GB RAM, 32GB on-board with microSDXC, 5.5″ 1080p, Nougat, factory unlocked. 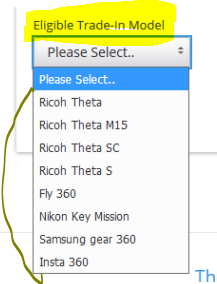 Even though they bought Pentax, Ricoh still has some cameras under its own name, such as their Theta series. A new model is born today in that series, the new THETA V 360 4K Spherical VR Camera, now available for pre-ordering for $430 at B&H Photo. 4K is so passe! How about 8K? The new Insta360 Pro Spherical VR 360 8K Camera is now available for pre-ordering for $3499 with free shipping at B&H Photo and Adorama. For more upcoming items, check the Pre-Order category. For new releases, check the In-Stock Alerts. If you are planning to place a $34.99+ order (to get free shipping), they have $7 Lens-Shaped Coffee Cups. The new Samsung Gear 360 4K Spherical VR Camera (2017 Version) is now in-stock and ready to ship for $230 at Adorama and B&H Photo and Verizon Wireless. Note that Verizon Wireless has a limited time promotion that gets you a $50 prepaid VISA gift card if you spend $200+ using coupon code 50BACK. Since this is priced at $230, you are eligible for the prepaid VISA gift card. This offer ends 5/29/17. Another offer running at Verizon Wireless also mentioned under “Description”, gets you the Gear 360 for just $50 IF you purchase it TOGETHER with either the Samsung Galaxy S8 or the S8+ smartphones from Verizon. The 360fly 4K Video Camera is currently on sale for $357 with free expedited shipping at B&H Photo and at Amazon by Amazon itself (limit up to three per customer). If you are of the LG persuasion, the new condition LG G5 Friends 360 CAM LG-R105 is currently going for $100 with free shipping, sold by Dealfisher, with the order fulfilled by Amazon, so it is Prime eligible. This is not a lightning deal. The Pentax K-1 came out at $1800 but it climbed to $1950 [see 35mm full frame price charts]. However, Adorama is sweetening the price increase a bit by including a $100 Adorama gift certificate with purchase at $1950… Meanwhile on the Ricoh front, the Ricoh Theta S 360 gets a $50 Adorama gift certificate going for its default price of $350 (along with $14~ promotional rewards and free overnight shipping). The Ricoh Theta M15 360 Degree Spherical Panorama Camera is now down to around $193 in the yellow, white and cyan-blue color options at Amazon and $195 but with a free strap attachment at Adorama in all four colors.